The ENIAC is certainly a far cry from what we use today! Computers are so much a part of our lives today that it would seem they have always been around. But the story is quite different. In the seventies, Steve Jobs used to tinker around with his father, who worked as a machinist in a laser factory. He discovered the world of computers and the virus never left him . Neither did his passion for innovation. In 1976, he and his friend Steve Wozniak sold their personal belongings for $ 1300 and shut themselves up in the Jobs’ family garage for six months. They came up with the first P.C., i.e. a computer that was both compact and user-friendly. The Apple I was marketed for the unheard of price of $ 666.66. That was the start of the third industrial revolution – Information Technology. Who were the Apple I’s ancestors? Many years of research preceded the IT revolution. 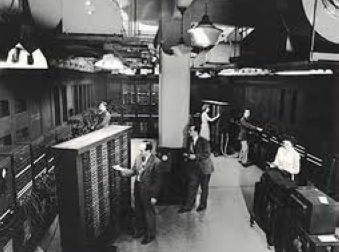 The very first computer, ENIAC (Electronic Numerical Integrator and Calculator), was invented in 1943. Built by American physician and inventor, John William Mauchly, it weighed over 30 tons, took up 1,800 square feet, contained 18,000 vacuum tubes and hundreds of thousands of resistors, capacitors and inductors. Hardly the sort you’d carry around! Today, on our planet, 11 computers are sold every second. And in just one second, these computers can carry out thousands of operations that would have taken 100 hours in 1971. We’ve come a long way, haven’t we? So, next weekend, how about meeting up in my garage for some creative tinkling! Our next issue: Have fun!, the Future Shapers’ first creative challenge!